The Miele Blizzard CX1 Bagless Vacuum Cleaner utilises Vortex Technology, an advanced dust separation system that gives you a highly efficient vacuum cleaner that can capture the most stubborn dust particles. The Vortex technology of the Miele Blizzard CX1 results in flow velocity speeds of over 100km/h, easily picking up coarse soiling and dust from your carpet. The CX1 has two separate containers one to hold coarser objects and particles, while the other holds onto fine dust. By using separate dust containers, the Blizzard CX1 minimises dust plumes that can escape when the container is emptied. A Gore CleanStream filter ensures the finest particles remain in their own compartment, allowing you to dispose of them separately and securely. The Miele Blizzard CX1 Vacuum was added to the Vacuums category in November 2017. 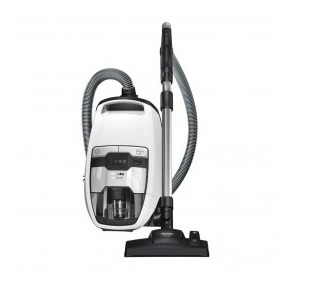 The lowest price GetPrice has found for the Miele Blizzard CX1 Vacuum in Australia is $599.00 from Appliances Online. Other merchants who stock it are Appliances Online, Appliance Central, Bing Lee.